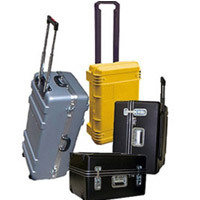 Allcases offers a wide range of equipment cases with wheels and other rolling cases. These rolling cases provide industry leading protection for items in transport, while offering maneuverability with telescoping handles and wheels. Many of these shipping cases with wheels offer multiple interior options, including empty and foam filled. As an Advanced Case Center, Allcases can also customize rolling cases with limitless options and custom foam. Cases with wheels are part of our complete shipping case and carrying case product line.